Werner Heisenberg proposed the uncertainty principle. The uncertainty principle,' sometimes called the Heisenberg uncertainty principle, states that interaction and mechanical action come in quanta, that is, in discrete units. While one can detect an integral number of quanta, one cannot detect one half or two thirds of a quantum. The quantum of interaction joins the quanta of energy, time, and space in the current description of the world. The size of all these quanta is small—which is why they appear continuous—and determined by the size of Planck's Constant. Thus, in quantum physics, the outcome of even an ideal measurement of a system is not deterministic, but instead is characterized by a probability distribution, and the larger the associated standard deviation is, the more "uncertain" one might say that characteristic is for the system. The Heisenberg uncertainty principle gives a lower bound on the product of the standard deviations of position and momentum for a system, implying that it is impossible to have a particle that has an arbitrarily well-defined position and momentum simultaneously. More precisely, the product of the standard deviations , where (pronounced "h-bar") is Planck's constant, h, divided by 2π (the circumference of the unit circle). The principle generalizes to many other pairs of quantities besides position and momentum. Examples of such complementary pairs are angular momentum about two different axes, and mass-energy in time, and can be derived directly from the axioms of quantum mechanics. Note that the uncertainties in question are characteristic of the nature of the physical world. In any real-world measurement, there will also be additional uncertainties created by the non-ideal and imperfect measurement process. The uncertainty principle holds true regardless of whether the measurements are ideal (sometimes called von Neumann measurements) or non-ideal (Landau measurements). Note also that the product of the uncertainties, of order 10−35 Joule-seconds, is so small that the uncertainty principle has negligible effect on objects of macroscopic scale and things appear to be continuous rather than quantal, rather like the pixels of a photo on a computer screen that, from a distance, blend into a continuum. The uncertainty principle was an important step in the development of quantum mechanics when it was discovered by Werner Heisenberg in 1927. It is connected to the observer effect—that observation requires interaction, and interaction involves a quantum of change, an unavoidable "disturbance" of the thing being observed. 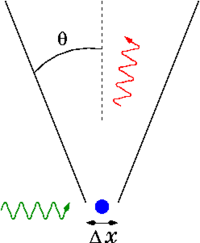 A fundamental postulate of quantum mechanics, which manifests itself in the Heisenberg Uncertainty Principle, is that no physical phenomenon can be (to arbitrary accuracy) described as a "classic point particle" or as a wave but rather the microphysical situation is best described in terms of wave-particle duality. The Heisenberg uncertainty principle is a consequence of this picture. The amplitude of the wave associated with a particle corresponds to its position, and the wavelength (more precisely, its Fourier transform) is inversely proportional to momentum. In order to localize the wave so as to have a sharp peak (that is, a small position uncertainty), it is necessary to incorporate waves with very short wavelengths, corresponding to high momenta in all directions, and therefore a large momentum uncertainty. Indeed, the Heisenberg Uncertainty Principle is equivalent to a theorem in functional analysis that the standard deviation of the squared absolute value of a function, times the standard deviation of the squared absolute value of its Fourier transform, is at least 1/(16π²) (Folland and Sitaram, Theorem 1.1). A helpful analogy can be drawn between the wave associated with a quantum-mechanical particle and a more familiar wave, the time-varying signal associated with, say, a sound wave. The main difference in the math is that while sound waves can be described by real numbers, the waves of quantum mechanics require the use of complex numbers involving the square root of minus one. This is called an "internal" wave function to distinguish it from external, real-numbered waves. The uncertainty principle in quantum mechanics is connected to the observer effect—that a measurement inevitably involves a whole quantum and subsequent change. Indeed, Heisenberg himself developed his concepts starting with this view. A measurement was visualized as a physical disturbance inflicted directly on the measured system, being sometimes illustrated as a thought experiment called Heisenberg's microscope. For instance, when measuring the position of an electron, one imagines shining a light on it, thus disturbing the electron and producing the quantum mechanical uncertainties in its position. It is understood that the uncertainties in the system exist prior to and independent of any the measurement, and the uncertainty principle is therefore more fundamental than the observer effect. where i, j, k are distinct and Ji denotes angular momentum along the xi axis. The Uncertainty Principle was developed as an answer to the question: How does one measure the location of an electron around a nucleus? In the summer of 1922, Heisenberg met Niels Bohr, the founding father of quantum mechanics, and in September 1924, Heisenberg went to Copenhagen, where Bohr had invited him as a research associate and later as his assistant. In 1925, Werner Heisenberg laid down the basic principles of a complete quantum mechanics. In his new matrix theory, he replaced classical commuting variables with non-commuting ones. Heisenberg's paper marked a radical departure from previous attempts to solve atomic problems by making use of observable quantities only. He wrote in a 1925 letter, "My entire meager efforts go toward killing off and suitably replacing the concept of the orbital paths that one cannot observe." Rather than struggle with the complexities of three-dimensional orbits, Heisenberg dealt with the mechanics of a one-dimensional vibrating system, an anharmonic oscillator. The result was formulae in which quantum numbers were related to observable radiation frequencies and intensities. In March 1926, working in Bohr's institute, Heisenberg formulated the principle of uncertainty, thereby laying the foundation of what became known as the Copenhagen interpretation of quantum mechanics. Albert Einstein was not happy with the uncertainty principle, and he challenged Niels Bohr and Werner Heisenberg with a famous thought experiment: Fill a box with a radioactive material which randomly emits radiation. The box has a shutter, which is opened and soon thereafter shut by a clock at a precise time, thereby allowing some radiation to escape. So the time is already known with precision. But the experimenter still wants to measure the conjugate variable energy precisely. Einstein proposed doing this by weighing the box before and after. The equivalence between mass and energy from special relativity will allow the experimenter to determine precisely how much energy was left in the box. Bohr countered as follows: Should energy leave, then the now lighter box will rise slightly on the scale. That changes the position of the clock. Thus, the clock deviates from a stationary reference frame, and by general relativity, its measurement of time will be different from the observer's, leading to some unavoidable margin of error. In fact, a detailed analysis shows that the imprecision is correctly given by Heisenberg's relation. The term, "Copenhagen interpretation of quantum mechanics" was often used interchangeably with and as a synonym for Heisenberg's Uncertainty Principle by detractors who believed in fate and determinism and saw the common features of the Bohr-Heisenberg theories as a threat. Within the widely but not universally accepted Copenhagen interpretation of quantum mechanics (that is, it was not accepted by Einstein or other physicists such as Alfred Lande), the uncertainty principle is taken to mean that on an elementary level, the physical universe does not exist in a deterministic form—but rather as a collection of probabilities, or potentials. For example, the pattern (probability distribution) produced by millions of photons passing through a diffraction slit can be calculated using quantum mechanics, but the exact path of each photon cannot be predicted by any known method. The Copenhagen interpretation holds that it cannot be predicted by any method, not even with theoretically infinitely precise measurements. It is this interpretation that Einstein was questioning when he said, "I cannot believe that God would choose to play dice with the universe." Bohr, who was one of the authors of the Copenhagen interpretation, responded, "Einstein, don't tell God what to do." Niels Bohr himself acknowledged that quantum mechanics and the uncertainty principle were counter-intuitive when he stated, "Anyone who is not shocked by quantum theory has not understood a single word." The basic debate between Einstein and Bohr (including Heisenberg's Uncertainty Principle) was that Einstein was in essence saying: "Of course, we can know where something is; we can know the position of a moving particle if we know every possible detail, and therefore by extension, we can predict where it will go." Bohr and Heisenberg were saying: "We can only know the probable position of a moving particle, therefore by extension, we can only know its probable destination; we can never know with absolute certainty where it will go." Einstein was convinced that this interpretation was in error. His reasoning was that all previously known probability distributions arose from deterministic events. The distribution of a flipped coin or a rolled die can be described with a probability distribution (50 percent heads, 50 percent tails), but this does not mean that their physical motions are unpredictable. Ordinary mechanics can be used to calculate exactly how each coin will land, if the forces acting on it are known. And the heads/tails distribution will still line up with the probability distribution (given random initial forces). Einstein assumed that there are similar hidden variables in quantum mechanics which underlie the observed probabilities and that these variables, if known, would show that there was what Einstein termed "local realism," a description opposite to the uncertainty principle, being that all objects must already have their properties before they are observed or measured. For the greater part of the twentieth century, there were many such hidden variable theories proposed, but in 1964 John Bell theorized the Bell inequality to counter them, which postulated that although the behavior of an individual particle is random, it is also correlated with the behavior of other particles. Therefore, if the uncertainty principle is the result of some deterministic process in which a particle has local realism, it must be the case that particles at great distances instantly transmit information to each other to ensure that the correlations in behavior between particles occur. The interpretation of Bell's theorem explicitly prevents any local hidden variable theory from holding true because it shows the necessity of a system to describe correlations between objects. The implication is, if a hidden local variable is the cause of particle 1 being at a position, then a second hidden local variable would be responsible for particle 2 being in its own position—and there is no system to correlate the behavior between them. Experiments have demonstrated that there is a correlation. In the years following, Bell's theorem was tested and has held up experimentally time and time again, and these experiments are in a sense the clearest experimental confirmation of quantum mechanics. It is worth noting that Bell's theorem only applies to local hidden variable theories; non-local hidden variable theories can still exist (which some, including Bell, think is what can bridge the conceptual gap between quantum mechanics and the observable world). Whether Einstein's view or Heisenberg's view is true or false is not a directly empirical matter. One criterion by which scientists may judge the success of a scientific theory is the explanatory power it provides, and to date, it seems that Heisenberg's view has been the better at explaining physical subatomic phenomena. The uncertainty principle is stated in popular culture in many ways, for example, by some stating that it is impossible to know both where an electron is and where it is going at the same time. This is roughly correct, although it fails to mention an important part of the Heisenberg principle, which is the quantitative bounds on the uncertainties. Heisenberg stated that it is impossible to determine simultaneously and with unlimited accuracy the position and momentum of a particle, but due to Planck's Constant being so small, the Uncertainty Principle was intended to apply only to the motion of atomic particles. However, culture often misinterprets this to mean that it is impossible to make a completely accurate measurement. The Michael Frayn play, Copenhagen, highlights some of the processes that went into the formation of the Uncertainty Principle. The play dramatizes the meetings between Werner Heisenberg and Niels Bohr. It highlights, as well, the discussion of the work that both did to help build nuclear bombs—Heisenberg for Germany and Bohr for the United States and allied forces. In the 1997 film, The Lost World: Jurassic Park, chaotician Ian Malcolm claims that the effort "to observe and document, not interact" with the dinosaurs is a scientific impossibility because of "the Heisenberg Uncertainty Principle, whatever you study, you also change." This is an inaccurate confusion with the observer effect. In the science fiction television series, Star Trek: The Next Generation, the fictional transporters used to "beam" characters to different locations overcome the limitations of sampling the subject due to the uncertainty principle with the use of "Heisenberg compensators." When asked, "How do the Heisenberg compensators work?" by Time magazine on November 28, 1994, Michael Okuda, technical adviser on Star Trek, famously responded, "They work just fine, thank you." In an episode of the television show, Aqua Teen Hunger Force, Meatwad (who was temporarily made into a genius) tries to incorrectly explain Heisenberg's Uncertainty Principle to Frylock in an effort to explain his new found intelligence. "Heisenberg's Uncertainty Principle tells us that at a specific curvature of space, knowledge can be transferred into energy, or—and this is key now—matter." In an episode of Stargate SG-1, Samantha Carter explains, using the uncertainty principle, that the future is not pre-determined, one can only calculate possibilities. Actress Amanda Tapping, who plays Carter, actually studied the Uncertainty principle in order to fully understand it. where is the standard deviation of the energy operator in the state , stands for the standard deviation of the operator and is the expectation value of in that state. Although, the second factor in the left-hand side has dimension of time, it is different from the time parameter that enters Schrödinger equation. It is a lifetime of the state with respect to the observable . In other words, this is the time after which the expectation value changes appreciably. The energy-time uncertainty principle has important implications for spectroscopy. Since excited states have a finite lifetime, they do not all release exactly the same energy when they decay; rather, the spectroscopic peaks are actually bumps with a finite width (called natural linewidth), with the center of the bump corresponding to the true energy of the excited state. For fast-decaying states, the linewidth makes it difficult to accurately measure this true energy, and indeed, researchers have even used microwave cavities to slow down the decay-rate, in order to get sharper peaks and more accurate energy measurements. One particularly famous false formulation of the energy-time uncertainty principle says that the energy of a quantum system measured over the time interval has to be inaccurate, with the inaccuracy given by the inequality . This formulation was explicitly invalidated by Y. Aharonov and D. Bohm in 1961. Indeed, one can actually determine the accurate energy of a quantum system in an arbitrarily short interval of time. Moreover, as recent research indicates, for quantum systems with discrete energy spectra the product is bounded from above by a statistical noise that in fact vanishes if sufficiently many identical copies of the system are used. This vanishing upper bound certainly removes the possibility of a lower bound, again disproving this false formulation of the energy-time uncertainty principle. Measurements of position and momentum taken in several identical copies of a system in a given state will each vary according to a probability distribution characteristic of the system’s state. This is the fundamental postulate of quantum mechanics. (h-bar) is the reduced Planck's constant (Planck's constant divided by 2π). where the operator [A,B] = AB - BA denotes the commutator of A and B, and denotes expectation value. This inequality is called the Robertson-Schrödinger relation, and includes the Heisenberg Uncertainty Principle as a special case. It was first pointed out in 1930, by Howard Percy Robertson and (independently) by Erwin Schrödinger. The uncertainty principle has a straightforward mathematical derivation. The key step is an application of the Cauchy-Schwarz inequality, one of the most useful theorems of linear algebra. In an inner product space the Cauchy-Schwarz inequality holds. where the operator [A,B] = AB - BA denotes the commutator of A and B. This formulation acquires its physical interpretation, indicated by the suggestive terminology "mean" and "standard deviation," due to the properties of measurement in quantum mechanics. Particular uncertainty relations, such as position-momentum, can usually be derived by a straightforward application of this inequality. ↑ K.K. Likharev and A.B. Zorin, Theory of Bloch-Wave Oscillations in Small Josephson Junctions, J. Low Temp. Phys. 59(3/4): 347-382. ↑ Time Magazine, Reconfigure the Modulators! Retrieved April 22, 2008. ↑ Gabrielse, Gerald and H. Dehmelt (1985). Observation of Inhibited Spontaneous Emission. Physical Review Letters 55: 67-70. Folland, G. and A. Sitaram. "The Uncertainty Principle: A Mathematical Survey." Journal of Fourier Analysis and Applications. (1997): 207-238. Heisenberg, W. "Über den anschaulichen Inhalt der quantentheoretischen Kinematik und Mechanik" Zeitschrift für Physik. 43 (1927): 172-198. Mandelshtam, L.I. and I.E. Tamm. "The uncertainty relation between energy and time in nonrelativistic quantum mechanics." Izv. Akad. Nauk SSSR (ser. fiz.) 9 (1945): 122-128. Matter as a Wave - a chapter from an online textbook. Quantum mechanics: Myths and facts. aip.org: Quantum mechanics 1925-1927—The uncertainty principle. Eric Weisstein's World of Physics—Uncertainty principle. Schrödinger equation from an exact uncertainty principle. John Baez on the time-energy uncertainty relation. This page was last modified on 6 January 2016, at 16:53.